← Cuil and Business Models: Complement, Replace or Create? In the recent post Who Is Your Information Filter?, I noted that individuals are emerging as leaders in the distribution of information. These Information Filters have good judgment as to what their subscribers like. The Likes and comments on Eric’s share included some folks who are subscribed to me. This is the sort of thing that I love to explore. What makes people respond to the sharing of identical content from one person, but not another? Interactions and relationships are an important part. Robert Scoble made this point in a comment on FriendFeed. Experience and passions make up your narrative, the story of your life. Context loads the information you share with meaning. Meaning draws interest by others. This takes a little explaining. Mark Rothko was an abstract painter, famous for paintings of rectangles (multiforms) with different colors. His life shared the drama that seems to mark many great artists. He was Jewish, and saw the persecution of Jews in Czarist Russia. His family emigrated to the United states. He was highly intelligent, rapidly advancing through school and receiving a scholarship to Yale. He divorced twice. He drank heavily. He ultimately committed suicide. And yet he was pivotal in the abstract movement of the mid-1900s. He hated being called an “abstract artist”, but he was leader in the genre. His is a rich history of art, intellect and experimentation. Growing up, I’d see art like his and think, “I could paint that. What’s so special about that painting?” Typical punk kid. This was my first painting effort since middle school. Please pardon the brush strokes. With practice, I could get the hang of the brush strokes. With time, I bet I could replicate Mark Rothko’s style pretty well. Which would make me a hell of an abstract painter, right? Obviously, the answer is no. Even if I could duplicate the style, no one would care. Why? I don’t have a narrative to back it up. I didn’t come up with the style, I wasn’t a participant in the abstract movement, I’m not a student of art or of Rothko, I’m not a painter. The silly adolescent that I was didn’t want to understand that. 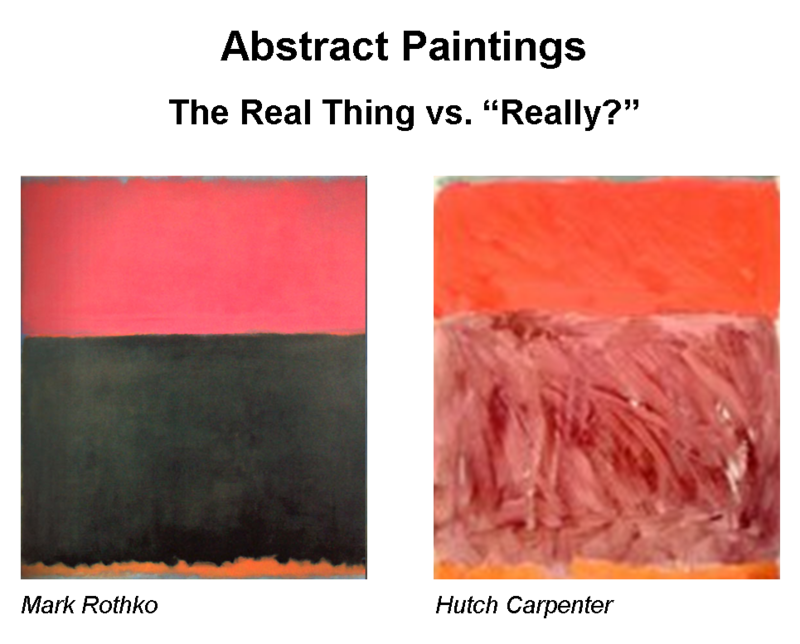 And yet understanding the importance of Rothko’s narrative imbues his paintings so much meaning. There is a lesson here in terms of people who shine as Information Filters. The context surrounding a piece of content is an important, underestimated component of what makes it valuable to an audience. If Thomas Hawk and I were to favorite the same photo on Zooomr, I suspect Thomas’s favorite would garner more Likes and comments on FriendFeed than would mine. Which makes all the sense in the world. Me? I’m just a dude who likes a picture. The pictures I share lack a larger narrative. My online narrative is really defined by this blog. So the lists above don’t surprise me. 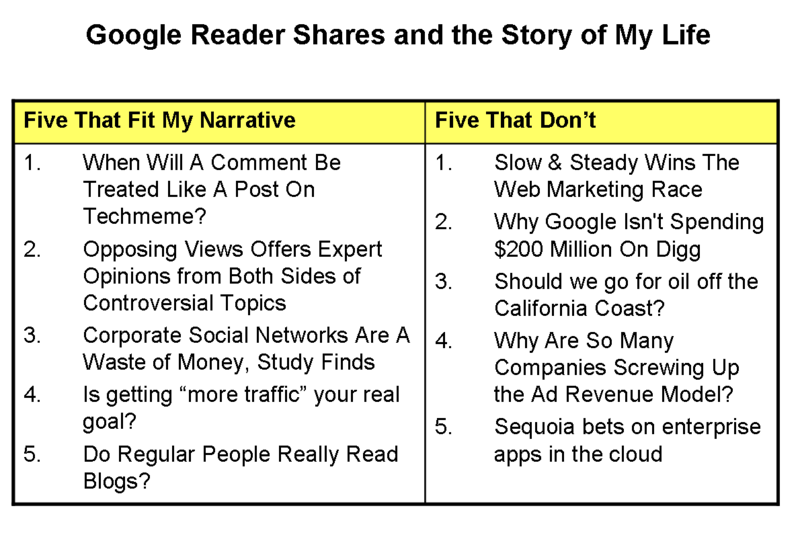 The five that fit my narrative are consistent with blogging, information consumption and distribution, and enterprise 2.0. The five that don’t fit my narrative reflect themes I generally don’t hit on here: online advertising, acquisitions, SAAS and the environment. Does that mean I should stop sharing them? Hell no! But it does show that the people who subscribe to me have particular interests, consistent with my narrative. I do think there’s an important point to be made. Sometimes people get exasperated that something they’ve blogged about or posted didn’t get a lot of traction, while an A-Lister talks about the same thing and everyone falls over themselves to Like, comment, share the content, etc. This is generally ascribed to an overly worshipful flock. I’m sure there’s a bit of truth in that. However, I think an overlooked element is that a lot of the well-known figures out on the web have a strong narrative. When they share something, it’s really part of the larger narrative they’ve been sharing with a lot of people over time. I bring up A-Listers because its a familiar meme. But there are regular people who have a particularly strong narrative in a subject area. You see people reacting to the content they share, because it fits what they’re about. Strong narratives make people strong Information Filters. How about you? What’s the story of your life? 13 Responses to What’s the Story of Your Life? I am pretty much a noob as far as the social media community is concerned. My blog is brand new. I think anything I share is pretty much taken at face value. I don’t believe I have even developed a story to put things into context yet. You’ve made my day (so far). Thought provoking post, Social Distortion mention and ART! Story is something I deal with everyday as a documentar(ian). I am a collection of molecules, imagination and the substance of those I have been blessed to encounter on this journey of life. I love that we live in an ever expanding Universe with much to explore! I can only wonder if time of day had anything to do with it (we’re both in the same time zone)– also, when does it appear on someone’s friends’ timeline? If mutual followers of ours follow someone really busy, I could have scored the luck of the draw in being the most recent thing on the screen. But yeah, very fascinating scenario. Rahsheen – I don’t think I’ve got a very strong narrative yet. Frankly I blog more to explore ideas and products. Hmmm…maybe that becomes a story in itself? Michael – I had fun putting this one together. Social D and abstract art. I’ve got a link out to Social D in two places in the post, no one anyone has clicked them though. Mark – knowing you, it will be well thought out. Eric – there probably are time of day issues. I’m not really sweating whether my shared stuff gets read, but I am interested in what drives people’s decisions. Understanding that can be quite helpful in a lot of areas. Well Mona – you’ve become a big-time distributor of fun stuff for the folks on FriendFeed. Count me as a fan. Keep it up. Not that I’m totally impressed, but this is more than I expected when I stumpled upon a link on Furl telling that the info here is quite decent. Thanks.